Meet the monster. It’s huge. It’s loud. It roars with V6 Power. Hold on tight for the ultimate thrill ride! Your helmet and protective gear are on. Your driver has strapped you in securely. High up on the Monster 4X4’s back you feel your adrenaline begin to pump. With a roar and utilising its massive suspension, it accelerates into the bush and tears up a steep track. 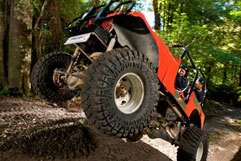 The 4X4’s unique 4-wheel steering mechanism helps to power through New Zealand native bush, up and down near-vertical slopes tackling the ‘Widow Maker’ and the ‘Loggers Long Drop’. Your knuckles are white as trees brush past. It twists; it bucks; it swerves; it tilts – every part of your body will be holding on tight. 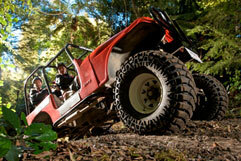 Off Road NZ is a sustainable premium adventure experience creating fun memories, personal growth and lasting impressions. 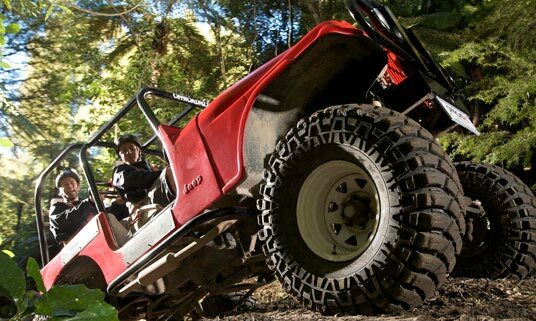 Established in 1992, Off Road NZ provides the best self-drive off road vehicle experiences of their type in New Zealand, including 4WD Bush Safaris and the all new Raceline Karting.